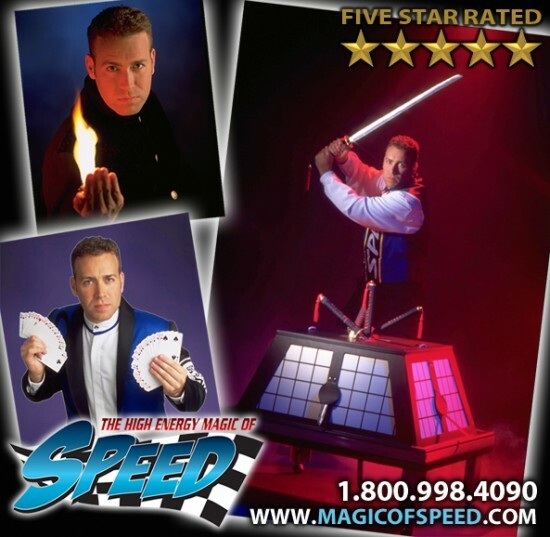 Speed and his Assistant "Curl"
Experience the High Energy Magic and Comedy by one of the East Coast's Premiere Magician and Illusionists... Speed! Speed performs close to 200 show a year nationally and is based in the Washington DC Metro area. Whether on a large stage, a banquet hall, or your very own living room...Speed can provide entertainment for kids and adults of all ages. Serving the entire United States including: Washington DC, Maryland, Virginia, Pennsylvania, New Jersey, West Virginia, Kentucky, North Carolina, and South Carolina. Insurance: $2,000,000 - The High Energy Magic of Speed is insure for General Liability for all Stage Performances. Unions: Society Of American Magicians - S.A.M. Experience the High Energy Magic and Comedy of one of the East Coast's premiere entertainers... Speed. Speed is the original "High Energy Magician and Illusionist" known for his hyperactive, fast-paced, fun and modern performance style. 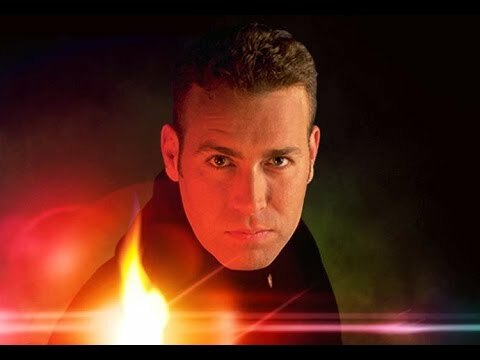 This amazing magician has performed over 3,500 live shows across the entire East Coast and Canada over the past 18 years. Speed has been featured in many Newspapers, TV, Internet and Radio Station Programs. The High Energy Magic of Speed, along with his bubbly assistant Curl, is one of the most sought after and requested magicians / illusionist in the Washington DC Metropolitan Area, often performing over 200 shows a year on a national basis. For the Kid and Family Audience, Speed will have your audience laughing and cheering out load with his patented brand of interactive comedy magic and hyperactive fun. The High Energy Magic of Speed will be sure to amaze your audience with his witty humor, mind blowing stage illusions and amazing energy. Speed is not afraid to break the rules by getting a little loud and crazy to make your event the best it can be. For the more sophisticated audience, Speed will tone down the craziness...a little, in order to intensify the magic. Speed will customize your specific show in order to blow your audience away with his handwork (manipulation), amazing magic effects, exciting stage illusions and sensational Dove Magic. Speed will leave your group or audience with their mouths opens gasping for air...totally blown away! The High Energy Magic of Speed has hours of magic in his arsenal to ensure new and electrifying magic for the most discerning and critical audience. Speed also has the ability to perform his exciting magic in miniature. 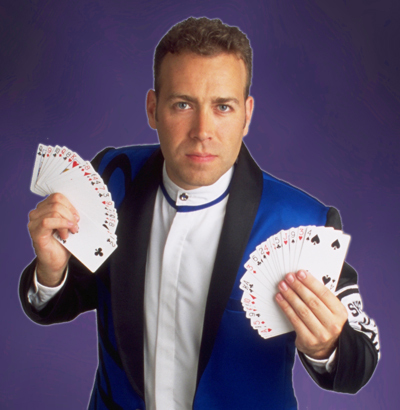 By combining his wacky comedy and unique style, with a more personal touch, Speed will entertain your audience or guests with walk around strolling magic. His high energy personality and magic will shine when you will witness his skill and dexterity in sleight of hand with cards, coins, and pocket magic. The High Energy Magic of Speed will not only delight your audience, it will totally mystify them with amazing magic. The High Energy Magic of Speed has many exciting options and shows to suit almost any event or audience. 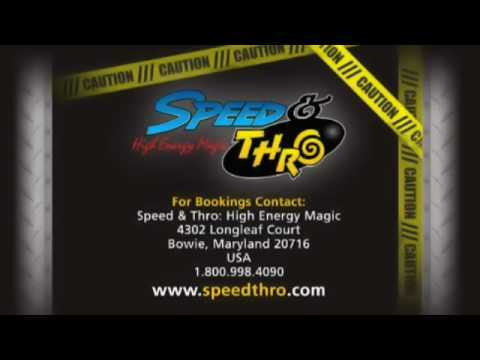 The High Energy Magic of Speed is a nationally performing act based in the Washington, DC area. Full Lighting, Sound and Backdrops are available when requested or needed. I have over 100 magic effects and tricks that perform on a regular basis, including over 30 large scale stage illusions. I will provide all sound, lighting, and backdrops if needed.